[options] and [filename] are optional. For this to work the MuseScore executable must be in %PATH% (Windows) resp. $PATH (Mac and Linux). If it is not, see Revert to factory settings for detailed instructions on how and where to find and execute the MuseScore executable from the command line on the various supported platforms. MuseScore is a Free and Open Source WYSIWYG cross-platform multi-lingual music composition and notation software, released under the GNU General Public Licence (GPLv2). Running mscore without any extra options launches the full graphical MuseScore program and opens any files specified on the command line. Export the given (or currently opened) file to the specified output file. The file type depends on the extension of the filename given. This option switches to “converter mode” and avoids the graphical user interface. When converting to PDF with the -o option, append each part’s pages to the created PDF file. If the score has no parts, all default parts will temporarily be generated automatically. Trim exported PNG and SVG images to remove whitespace surrounding the score. The specified margin, in pixels, will be retained (use 0 for a tightly cropped image). When exporting to SVG, this option only works with single-page scores. MuseScore also supports the automatic Qt command line options. The top-level element must be a JSONArray, which may be empty. in: Value is the name of the input file (score to convert), as JSONString. plugin: Value is the filename of a plugin (with the .qml extension), which will be read from either the global or per-user plugin path and executed before the conversion output happens, as JSONString. Optional, but at least one of plugin and out must be given. out: Value is the conversion output target, as defined below. Optional, but at least one of plugin and out must be given. The conversion output target may be a filename (with extension, which decided the format to convert to), as JSONString. The conversion output target may be a JSONArray of filenames as JSONString, as above, which will cause the score to be written to multiple output files (in multiple output formats) sequentially, without being closed, re-opened and re-processed in between. If the conversion output target is a JSONArray, one or more of its elements may also be, each, a JSONArray of two JSONStrings (called first and second half in the following description). This will cause part extraction: for each such two-tuple, all extant parts of the score will be saved individually, with filenames being composed by concatenating the first half, the name (title) of the part, and the second half. The resulting string must be a valid filename (with extension, determining the output format). If a score has no parts (excerpts) defined, this will be silently ignored without error. portable network graphics (image) — Individual files, one per score page, with a hyphen-minus followed by the page number placed before the file extension, will be generated. Set this (the value does not matter) to skip initialisation of the JACK Audio Connection Kit library, in case it causes trouble. User configuration location; defaults to ~/.config if unset. User data location; defaults to ~/.local/share if unset. Note that MuseScore also supports the normal Qt environment variables such as QT_QPA_GENERIC_PLUGINS, QT_QPA_PLATFORM, QT_QPA_PLATFORMTHEME, QT_QPA_PLATFORM_PLUGIN_PATH, QT_STYLE_OVERRIDE, DISPLAY, etc. /usr/share/mscore-3.0/ contains the application support data (demos, instruments, localisation, system-wide plugins, soundfonts, styles, chords, templates and wallpapers). In the Debian packages, system-wide soundfonts are installed into /usr/share/sounds/sf2/, /usr/share/sounds/sf3/ or /usr/share/sounds/sfz/, respectively, instead. The per-user data (extensions, plugins, soundfonts, styles, templates) and files (images, scores) are normally installed into subdirectories under ~/MuseScore3/ but may be changed in the configuration. Note that snapshot, alpha and beta versions use MuseScore3Development instead of MuseScore3 in all of these paths. $XDG_CONFIG_HOME/MuseScore/MuseScore3.ini contains the user preferences, list of recently used files and their locations, window sizes and positions, etc. See above for development version paths. $XDG_DATA_HOME/data/MuseScore/MuseScore3/ contains updated localisation files downloaded from within the program, plugin information, cached scores, credentials for the musescore.com community site, session information, synthesiser settings, custom key and time signatures and shortcuts. See above for development version paths. The last part of the job would, for example, cause files like “Piece with excerpts (part for Violin).pdf” to be generated alongside the conductor’s partitura and a MIDI file with the full orchestra sound, whereas the equivalent part of the Reunion conversion will be silently ignored (because the Reunion piece (a MuseScore demo) has no excerpts defined). The attached midi_import_options.xml is a sample MIDI import operations file for the -M option. The mscore utility exits 0 on success, and >0 if an error occurs. Project Issue Tracker — Please check first to if the bug you’re encountering has already been reported. If you just need help with something, then please use the support forum instead. MuseScore was split off the MusE sequencer in 2002 and has since become the foremost Open Source notation software. MuseScore is developed by Werner Schweer and others. This manual page was written by mirabilos <tg@debian.org>. The automatic Qt command line options are removed from the argument vector before the application has a chance at option processing; this means that an invocation like mscore -S -reverse has no chance at working because the -reverse is removed by Qt first. MuseScore does not honour /etc/papersize. Probably some more; check the project’s bug tracker (cf. SEE ALSO). While all members of the development team did their best to make the software easy to use and bug-free, there are some known issues and limitations in MuseScore 3.x. The local time signature feature, which allows you to have different time signatures in different staves at the same time, is very limited. You can only add a local time signature to measures that are empty, and only if there are no linked parts. When adding notes to measures with local time signatures, you can enter notes normally via note input mode, but copy and paste does not work correctly and may lead to corruption or even crashes. The join and split commands are disabled for measures with local time signatures. 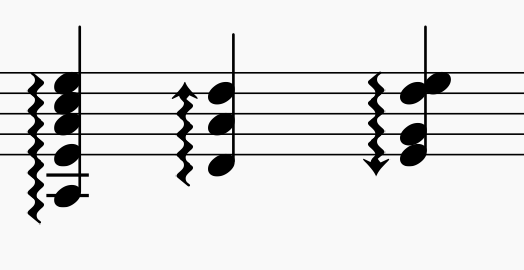 The Regroup Rhythms command found under the Layout menu may have unintended side effects, including changing the spelling of pitches and deleting some elements like articulations, glissandos, tremolos, grace notes and, esp. on undo, ties. Use this tool with caution on limited selections, so that you can tell if any unwanted changes are made. When entering multiple-note chords on a standard staff in a linked staff/tablature system, the notes should be entered in order from the top (first) string to the bottom string to ensure correct fret assignment. This limitation does not apply if entering notes directly onto a tablature staff, or when using an unlinked staff/tablature system. Changing settings in the mixer other than the sound doesn't mark the score 'dirty'. That means if you close a score you may not get the warning "Save changes to the score before closing?". Changing mixer values are also not undoable. There is no way to edit Header and Footer in a WYSIWYG manner. The fields in Format → Style → Header, Footer, Numbers are plain text. They can contain "HTML like" syntax, but the text style, layout, etc. can't be edited with a WYSIWYG editor. Download and install the latest version from the download page as described at Installation. If you want to remove 1.x nor 2.x, check the installation page of the 1.x handbook. Installing MuseScore 3 won't uninstall 1.x nor 2.x —all three versions can coexist peacefully and can even be used in parallel. So this isn't really an upgrade but an installation of a new and different program. MuseScore 3 significantly improved the typesetting quality to make scores attractive and easier to read. Improvements cover many items such as beam slope, stem height, layout of accidentals in chords and general note spacing. However, this means that sheet music made with MuseScore 1.x or 2.x looks slightly different from sheet music made with 3.x. It also means that scores saved with 3.x won't open with 1.x nor 2.x. If you did not manually adjust the layout of a 1.x or 2.x score, then MuseScore uses the 3.x typesetting engine to layout the score. If you did touch the layout of the 1.x or 2.x score, the individual adjustments you may have made should remain after opening it in MuseScore 3.x, but due to slight changes in the surrounding layout they may still not appear correct in context. If you wish to reset even manual adjustments to use the 3.x typesetting engine throughout, select the complete score with the shortcut Ctrl+A (Mac: Cmd+A) and reset the layout with Ctrl+R (Mac: Cmd+R). MuseScore 3 includes a number of new and improved features. For a brief summary, see the Release notes for MuseScore 3.0. More details can be found in the summaries below and by referring to the relevant pages of the handbook. MuseScore initially places elements in the score according to (a) the properties specified in style defaults and (b) any manual adjustments made. For elements that have automatic placement enabled, however, MuseScore will attempt to avoid collisions by moving one or more of them as needed. The default position for most elements is controlled by settings in Format → Style. You can either change the default there, or, in the Inspector, apply a manual adjustment (see below) and then use the "Set as style" control (to the right of the value you wish to set). Many elements can be placed either above or below the staff. To flip an element from above to below or vice versa, use the "Placement" setting in the Inspector, or press the shortcut "X". Manual adjustments to position can be performed by dragging or by changing the offsets in the Inspector. Neither method will allow you to position an element in a way that causes a collision, however. To take full control of the position of an element, you can disable automatic placement for it. To disable automatic placement for an element, untick the "Automatic placement" box in the Inspector. The element will revert to its default position, and it will no longer be considered when automatically placing other elements. The "Stacking order" setting in the Inspector controls which elements overlap which in the cases where they actually do overlap and are not moved due to autoplacement. The text style associated with the element sets the defaults for properties such as the font, alignment, and frame. Changes to these text properties can be applied to selected elements via the Inspector. Custom formatting can be applied to specific characters within the text using the text toolbar. See Text basics, Text styles and properties. Each text element has a text style associated with it. The default style for an element is determined by the type of the element itself - staff text defaults to the Staff text style, dynamics to the Dynamics text style, etc. This text style determines the default font face, size, style (bold/italic/underline), alignment, and frame properties. You can change the defaults for any of these text styles using Format → Style → Text Styles. For instance, you can make rehearsal marks bigger, or change lyrics to be italicized. This will affect all existing elements using that style as well as elements you add later. Some elements also contain a limited set of text style controls in their own sections of the Format → Style dialog (although this might not be the case in the final release). The settings are linked: you can change the font size for measure numbers in either Format → Style → Measure Numbers, or in Format → Style → Text Styles: Measure Number. The effect is the same: all measure numbers in the score will take on this size. You can also change the defaults for a text style using the Inspector; see Text Properties below. For most text elements that you create directly (like staff text, rehearsal marks, and lyrics), you can apply a different text style using the Style control in the Inspector. This will cause them to display using that style instead of the "native" style for the element. For example, you can select one or more staff text elements and give them the Tempo style to force them to display as if they were tempo markings. The text style controls the default properties for elements using that style, but you can override any of these properties for selected elements using the Inspector. For example, you can select a handful of staff text elements using Ctrl+click, then use the Inspector to make them larger. The Reset to Default button next to each property control returns it to the default. You can also click the Set as Style button to change the style to match. So another way to change the size of all measures numbers is to select one, change its size in the Inspector, then click Set as Style. Custom formatting is applied to text using the Text editing. You can change various staff properties mid-score, including staff size, notehead scheme (e.g., for pitch name noteheads), generation of time signatures, and others. The staff type change element is found on the Text palette (currently, but see #278205: Move Staff Type Change to another palette (it is not text) - it may move). Add it to the measure where you want the change to occur, then use the Inspector to change properties of the staff type change element. To create a temporary staff that appears on certain systems only: first add the staff normally (Edit / Instruments), then add notes, then right-click the staff, click Staff Properties, and set "Hide when empty" to "Always". This will cause the staff to show only where needed even without needing to turn on "Hide empty staves" for the whole score (in Format / Style). The default for "Hide when empty" is "Auto", meaning the staff will be hidden when empty if "Hide empty staves" is enabled. Additional values include "Never" (the staff will not be hidden when empty even if "Hide empty staves" is enabled) and "Instrument" (for instruments containing multiple staves, the staff is hidden only if all staves for that instrument are empty). To create a cutaway staff in which only the measures containing notes are visible (for ossia or cutaway scores, for example), right-click the staff, click Staff Properties, and enable the "Cutaway" option. This can be used independently of "Hide when empty" or "Hide empty staves". System dividers are a set of short diagonal lines that are used to visually separate systems on a page. Musecore can add these to your score automatically. In Format → Style rarr; System, you can enable dividers on the left, right, or both, and you can set their default position. You can also adjust the position of individual dividers in your score manually or mark them invisible (this currently does not survive saving). As part of the automatic placement in MuseScore, staves are now spaced automatically, so you can set a comfortable minimum distance and depend on MuseScore to open up more space where needed. You can use staff spacers as in MuseScore 2 to increase distance between staves, but MuseScore 3 now also provides a way to decrease it—the "fixed" staff spacer, found on the Breaks & Spacers palette. Just add the spacer and adjust its height. This will also prevent MuseScore from automatically adding more space to avoid collisions, allowing you to manage this yourself. In addition to the ability to generate parts from the different instruments in your score, you can now also associate a part with a specific staff within the instrument or even a specific voice within a specific staff. This allows you to combine multiple parts (e.g., Flute 1 & 2) onto a single staff in the score while still generating separate parts. The Parts dialog now contains two sections at the bottom, Instruments in Score and Instruments in Part. Once you have generated a part (or all parts) using the New and New All buttons, you can select any part at the top and use the controls at the bottom to control not only what instrument is in the part, but also which staves and voices within the instrument are included. To add an instrument to a part, select it from "Instruments in Score" and press "+". To remove an instrument from a part, select it from "Instruments in Part" and press "-". To customize the part at the staff or voice level, click the arrow next to the instrument in "Instruments in Part" to expand the listing to show all staves and voices of the instrument. You can remove a staff by selecting it and pressing "-", or remove a voice by unchecking it. Limitations: If you select only voice 1 for a given staff, then only the content in voice 1 for that staff will be included in the part. Thus, in order to share flute 1 & 2 on the same staff, you will need to enter all notes onto both voices, even in passages where they share content. You also cannot enter the two parts as chords in the passages where they share rhythms. Explode has been updated to allow separation of voices as well as notes. See Explode. The implode tool (Tools / Implode) works in one of two modes. With a single staff selected, the implode command merges notes in different voices into chords where possible (when notes are on the same beat and have the same duration). This is the same as recent versions of MuseScore, although some bugs have been fixed. With multiple staves selected, the implode command combines the content of the first four non-empty voices (on any staves) into multiple voices on the top selected staff. This is different from MuseScore 2, where notes would be combined into chords rather than using multiple voices, and thus required the rhythms to match. The MuseScore 3 approach preserves the original rhythms even where they differ, and is intended to produce the expected results when combining two different parts onto one staff for use with the parts from voices feature, or when reducing an open (four-stave) SATB score into a closed (two-stave) version. To further merge the voices into chords where possible, simply run the command again. You can insert and delete notes and have the measure automatically expand or contract to accommodate the change. This can be useful in creating unmetered music or in ordinary editing. To insert a note before the currently-selected note, press Ctrl+Shift while adding the note normally. For example, in note input mode, Ctrl+Shift+click will insert a note of the currently-selected duration at that location. Ctrl+Shift+B will insert a B of the currently-selected duration before the note at the current cursor position. You can also switch to Timewise note input mode using the dropdown menu next to the note input button on the toolbar. In this mode, all notes you add act as if you were pressing Ctrl+Shift - they are inserted rather than replacing the existing notes or rests at that location. To delete notes, you must be in normal (not note input) mode. Select either a single note or a range and press Ctrl+Delete. To split a measure before a given note, simply insert a barline from the palette at that point while holding Ctrl. For example, you can select the note, and Ctrl+double-click the barline in the palette, or Ctrl+drag the barline to the note. You can also use Tools → Measure → Split Measure Before Selected Note/Rest. To join two measures, Ctrl+Delete the barline between them. You can also use the menu command Tools → Measure → Join Measures. The Timeline presents a graphical overview of your score. To access it, use View →Timeline (F12). The top portion of the Timeline shows the location of tempo, key, and time signature changes as well as rehearsal marks, repeats, and double barlines. The bottom portion shows the staves of your score, with non-empty measures highlighted. You can click anywhere within this view to jump to the corresponding spot in the score. The Score Comparison Tool (View / Score Comparison Tool) allows you to compare two versions of a score to find the differences between them. Select the two scores you want to compare and whether you want to compare the current version or the last saved version (note you can compare the current version of a score against the last saved version of the same score to see what you have changed since the last save), then click the Compare button. A list of differences of differences will be displayed to the right. The score view will automatically change to Documents Side by Side, with the two scores you have selected displayed within. Double-click on a difference from the list and both score views will automatically pan to show you the changed element, which will also be highlighted. Normally you would want the default Intelligent comparison, which displays the differences in human-readable format (eg, "Measure 1: Note: property pitch changed from B4 to C5"). There is also a Raw mode to show the results according to the actual XML code. See Piano roll editor (preliminary page). Capo changes are now a property of staff text, and can be used to automatically change the pitch of all notes that follow them, up until another capo change. New UI. See Fretboard diagrams.